"May Chang" redirects here. For Fullmetal Alchemist character, see List of Fullmetal Alchemist characters § Xing. May Chang (Litsea cubeba; Aromatic litsea) is an evergreen tree or shrub 5–12 meters high in the Lauraceae family. It is native to China, Indonesia, Taiwan and other parts of Southeast Asia. It is called "mountain pepper" (山胡椒) in Mandarin and maqaw (馬告) by the Atayal aborigines in Taiwan. As a famous spice among Taiwanese aborigines, a proposed National Park at Yilan County is named "Magao" after the spice. It produces a fruit which is processed for its lemony essential oil. The oil can also be extracted from the leaf, but this is considered to be lower in quality. The timber is sometimes used for making furniture and crafts. Plant parts are also used in medicine. Essential oil yields from the fruit are 3-5%. The oil's main component is citral, at 70-85% of the oil. It is mainly produced in China from plantations and is marketed as "Litsea cubeba", with production estimates between 500 - 1,500 tonnes of oil per annum. The oil is used as a fragrance (especially in bar soap) and for flavouring in its own right. It is also used as a raw material by the chemical industry for the synthesis of vitamin A and violet-like fragrances. Studies are being done on the essential oil from the seed for treatment of lung cancer. ↑ Seal, S; Chatterjee, P; Bhattacharya, S; Pal, D; Dasgupta, S; Kundu, R; Mukherjee, S; Bhattacharya, S; Bhuyan, M; Bhattacharyya, P. R.; Baishya, G; Barua, N. C.; Baruah, P. K.; Rao, P. G.; Bhattacharya, S (2012). "Vapor of volatile oils from Litsea cubeba seed induces apoptosis and causes cell cycle arrest in lung cancer cells". PLoS ONE. 7 (10): e47014. doi:10.1371/journal.pone.0047014. PMC 3473030 . PMID 23091605. 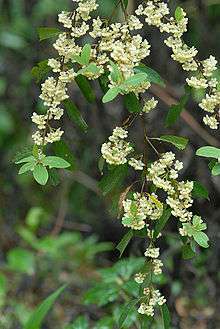 "Litsea cubeba". Integrated Taxonomic Information System. Retrieved October 26, 2006.